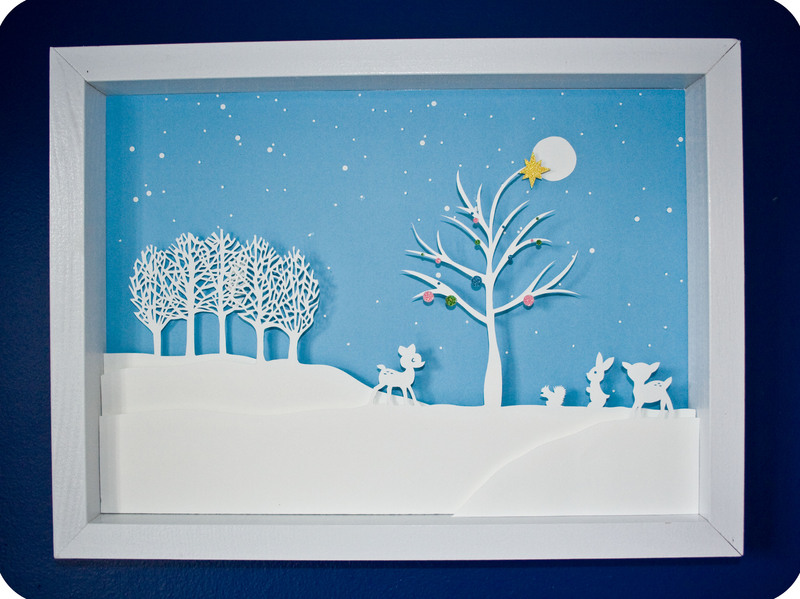 I don’t know if you remember, but wayyyyyyy back in 2011 I did a tutorial on how I do my 3D papercuts…. 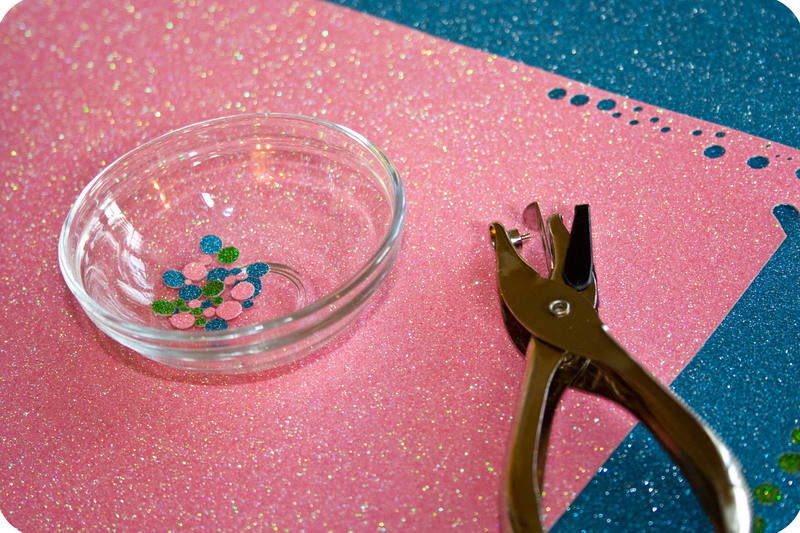 I made the tutorial to share with a great blog, Sugar Bee Crafts, but today I wanted to post it right here on my blog! It is a little Christmas-y… the decorated tree kinda gives that away, huh??? But it’s still hanging in our dining room, we just had a nice little winter snow storm last week (that kept us at home for a week looking at the walls…. yes, my husband started painting the walls again today… see??? we really have been staring at the walls around here!) and I’m thinking about doing a springy or Valentine’s day one too… So I guess what I’m trying to say is, I’ve been thinking about it for a while, so I thought I’d share it again! 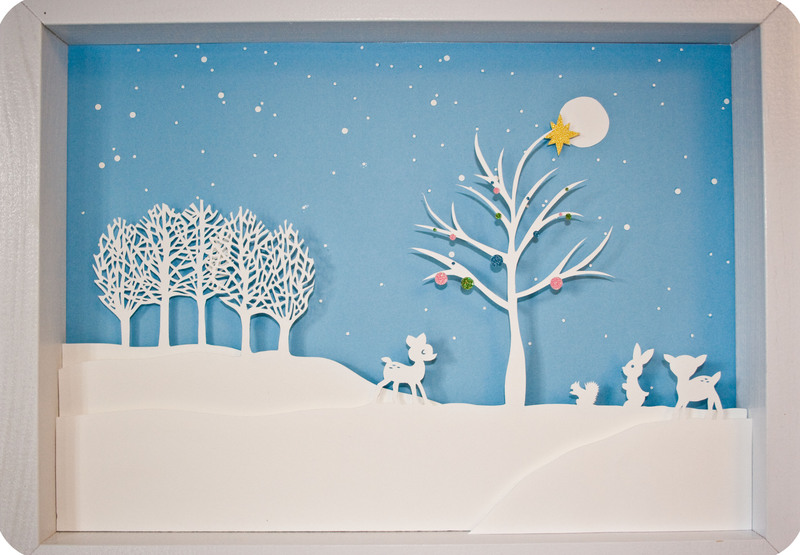 The other projects I’ve become obsessed with lately are paper cut art pieces! I made one for Halloween and absolutely loved it, so thought I’d make another winter one. That idea grew into a tutorial that I want to share with you today! Step 1- Gather the materials! Frame- I actually used a wooden painting panel (1 1/2″ depth) turned backwards! Paper! 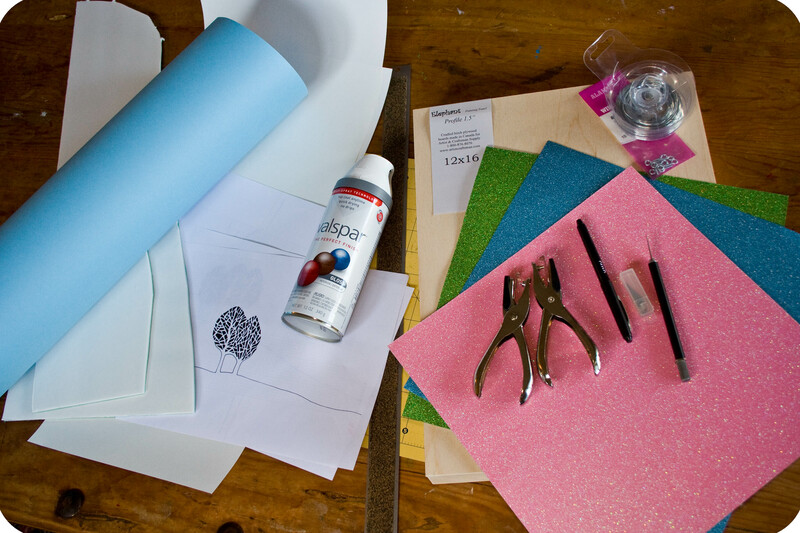 The blue background paper, the white paper, gold glitter paper for the star, and glitter paper for the tree ornaments. Images- If you’d like to use mine, download them here. 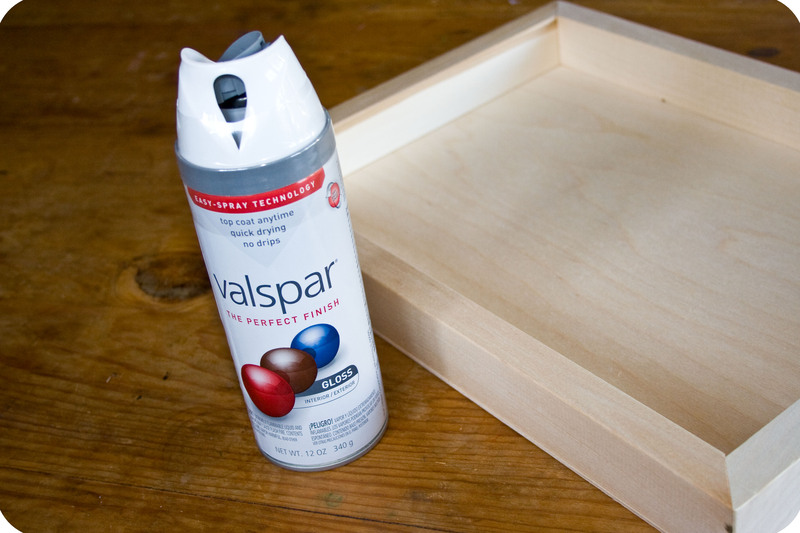 Step 2- Spray Paint the frame. This is going to be Step 2 and a few in-between steps throughout. I started with this step. Then moved on to the next steps and between steps would go add my second and third coats of paint. 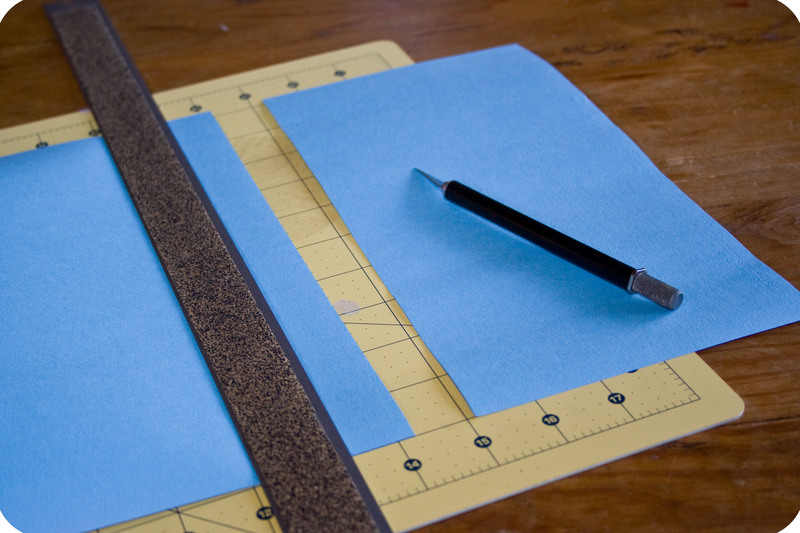 Step 3- Cut the background paper. 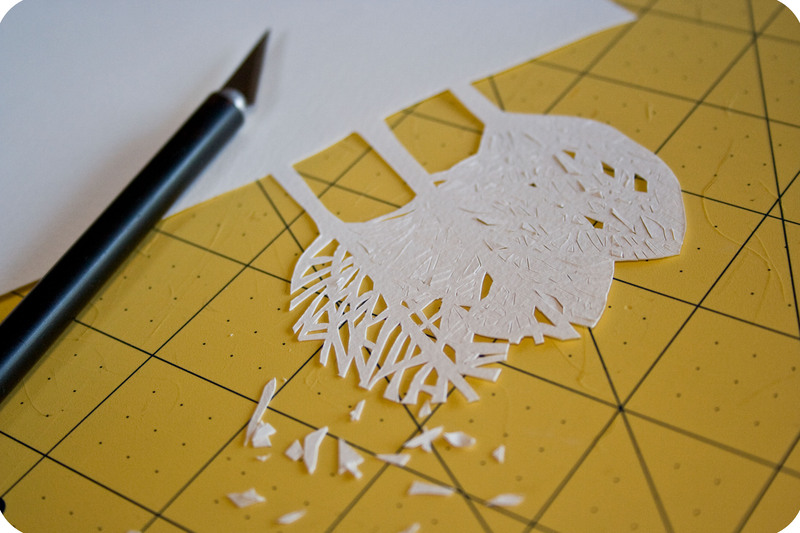 Step 5- The Papercuts- Part 2! Yep, another long step… Remove the image from Step 4. This is where you replace your knife blade and go in and actually connect all the lines for nice sharp corners. Also, don’t forget to cut the moon. Step 6- Cut the Foam Core. 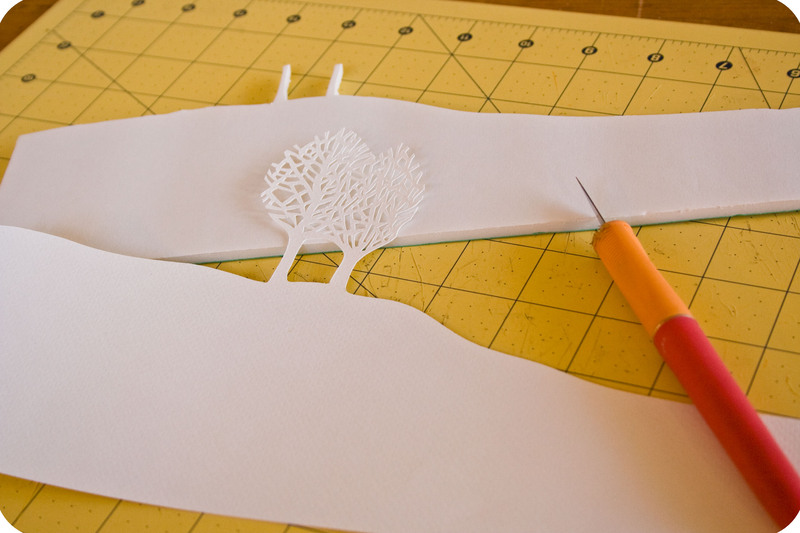 Outline the ground-line of the paper cut on the foam core and then cut the foam core about a 1/4″ shorter than the actual paper cut for each layer. Step 7- Tape the Foam Core. 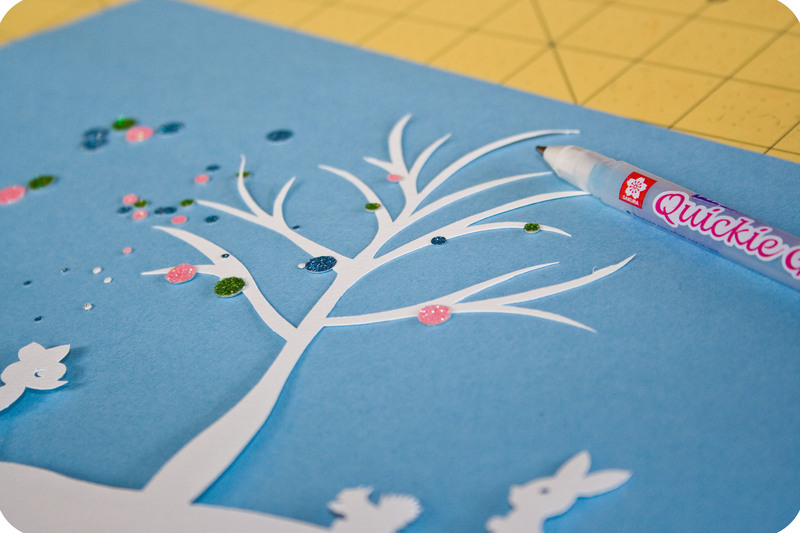 Tape the foam core to the papercuts with double-sided tape. 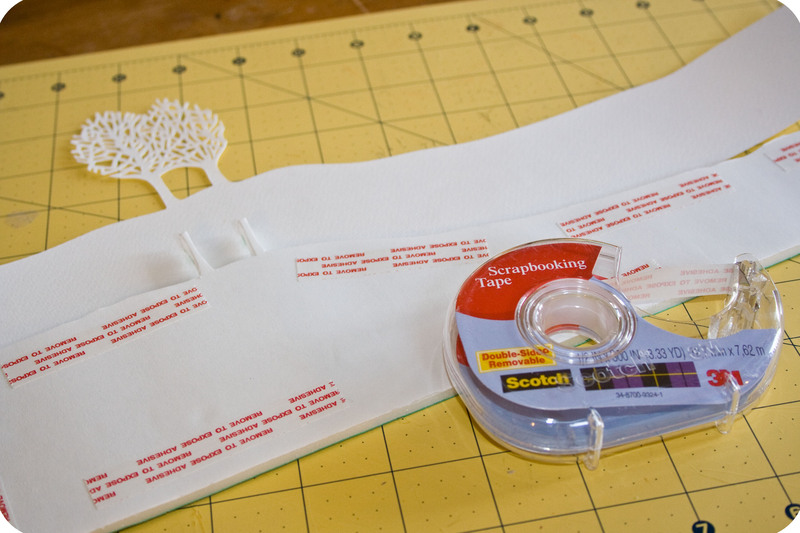 I love this Scotch tape! It says it’s removable, but it holds really well!! Step 8- Punch out the snow. 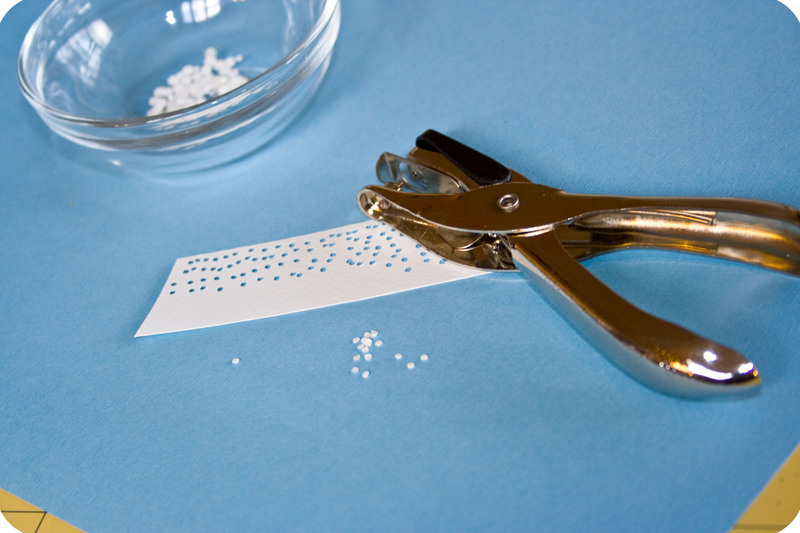 I used both of the smaller hole punches for the snow and primarily the 1/16th inch punch. Step 9- Glue on the moon and the snow. First I laid out where the moon was going to be and then glued it down. I sprinkled all the snow on, then adjusted if there were any clumps of areas with too much snow. Then I glued it down. 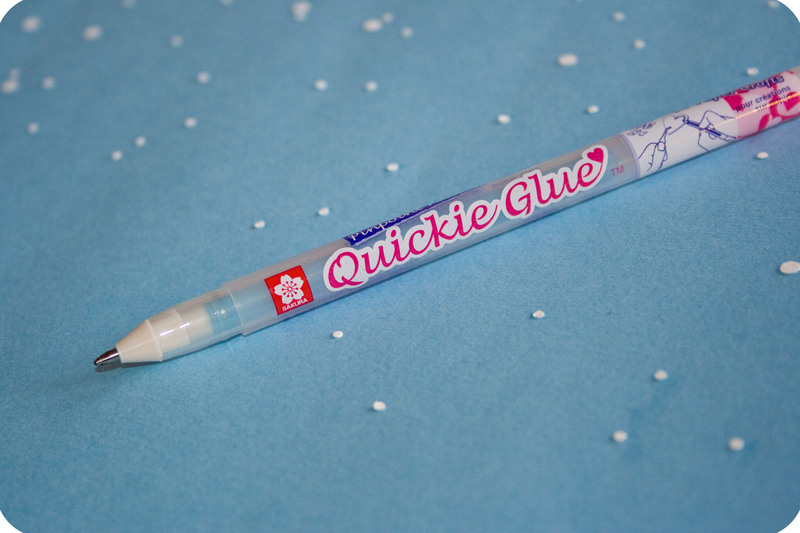 I was planning on just using regular glue, but imagine my surprise when I found this WONDERFUL ball point glue pen. LOVE IT! Step 10- Punch tree ornaments. I used all three hole punches for the ornaments. 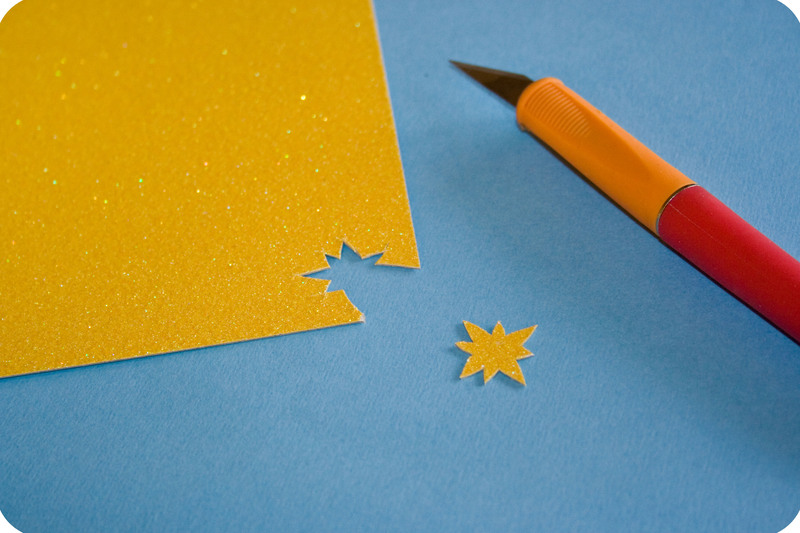 Step 11- Cut out the star! 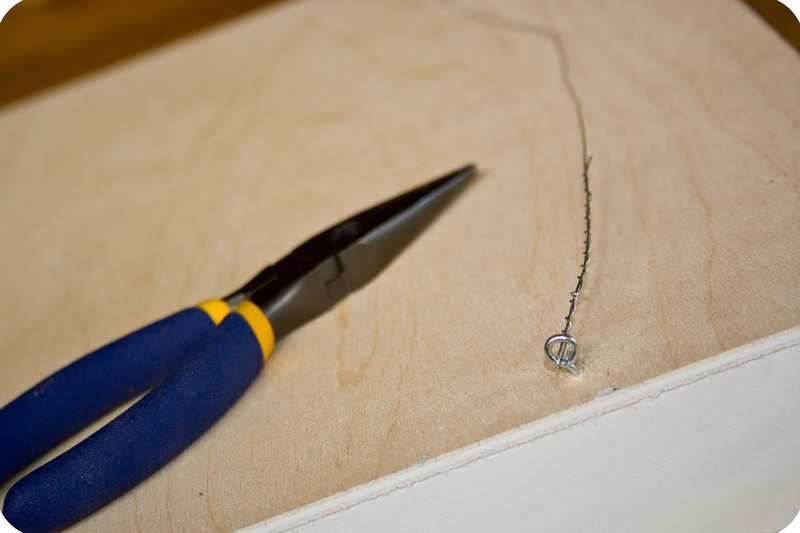 Step 12- Take a break from the actual art piece and add the picture hanging wire. Step 13- Assemble all the pieces! 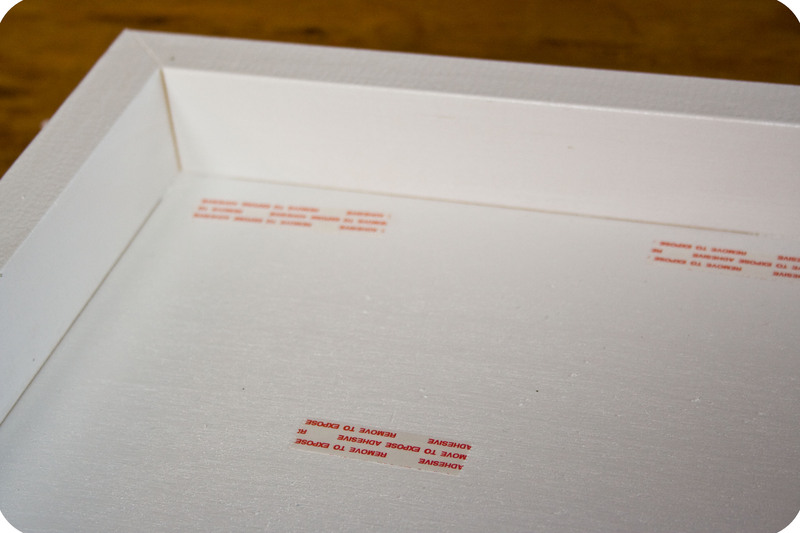 Start by adding the double-sided tape to the back of the frame. 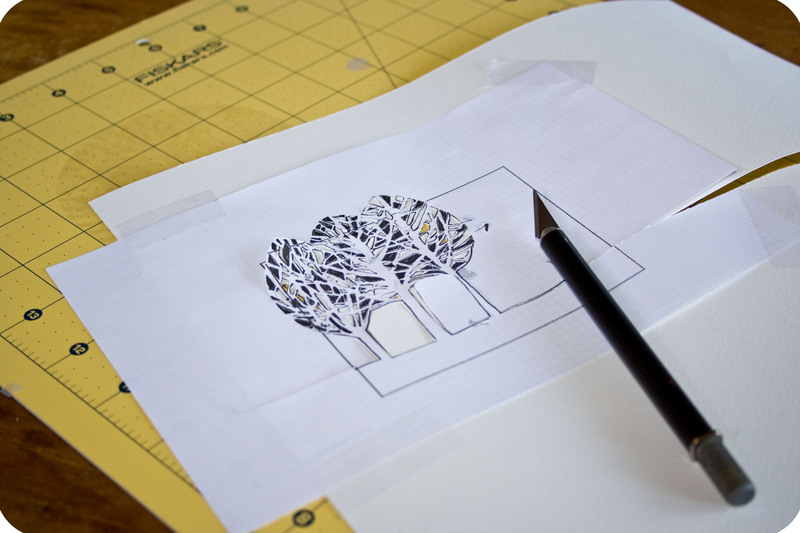 Then continue by adding the tape to each layer and building up the piece. And lastly, add the star to the top of the tree! Just like in our house, the star (or angel, depending on the year) is always the last ornament! Step 14- Hang it up and enjoy! I’m so excited about my new paper cut obsession! What do you think? I’m thinking art shows, my name in lights, world acclaim…. Ok, Maybe I’ll just stick to making them for my home…. ahhhh… that felt good to get this posted yet again! Hope you don’t mind the repost… I’ve been working hard on some fun stuff, so of course, there’s good stuff coming the next couple of weeks!!! I can’t wait to show ya some of the other things I’ve been working on. Shared with the these link parties! OMGOSH, this one I love, too! Those deer! Those trees! LOVE, LOVE, LOVE it! Thank u so much for to info..neatly explained..